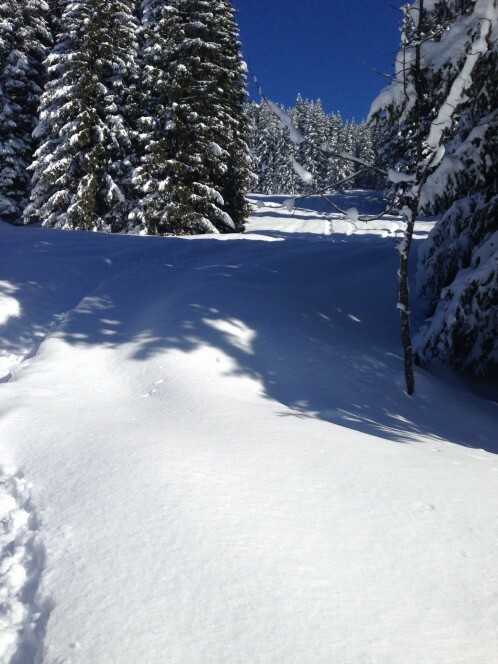 It’s half term, the pistes are busy, the lift queues are long, but the sun is shining and and it snowed a foot and a half yesterday -so what do a pack of beleaguered chalet girls do? 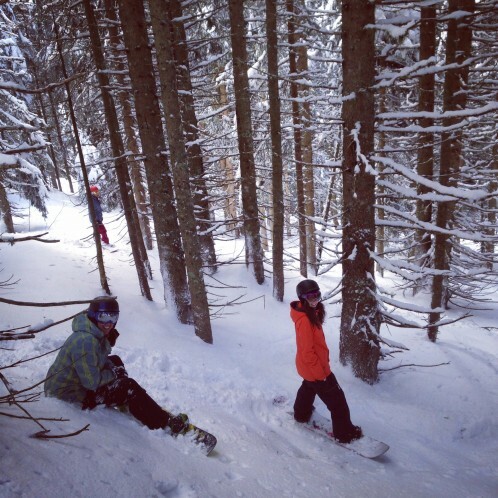 Easy, head for the trees.I honestly think the most fun times I have had on the hill in the past couple of years have been a few hours sessioning tree runs around Lindarets and Super Morzine. 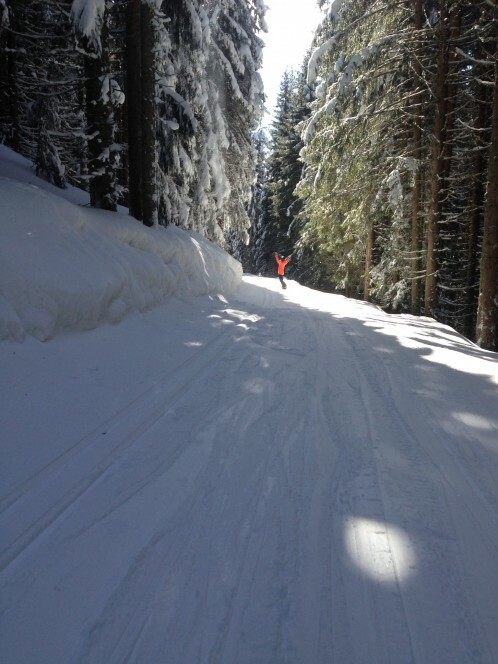 The beauty of skiing or snowboarding in trees is the combination of quietness, untouched powder and incredible scenery. There is also the added bonus of privacy, which is of course important if you’re worried about making a fool of yourself falling over-a lot. Riding through trees isn’t easy, it requires lots of practice and soon shows up any faults in your technique. For me though that’s part of the fun, it requires you to think that little bit more, to plan your turns as far in advance as the tree pack will allow and have quick reaction times. It’s a massive tactical game. The best piece of advice I was given for tree riding was from Olly, who told me to ” look at the space you want to go through, not at the thing you want to avoid”. A lesson for life not just for the trees. 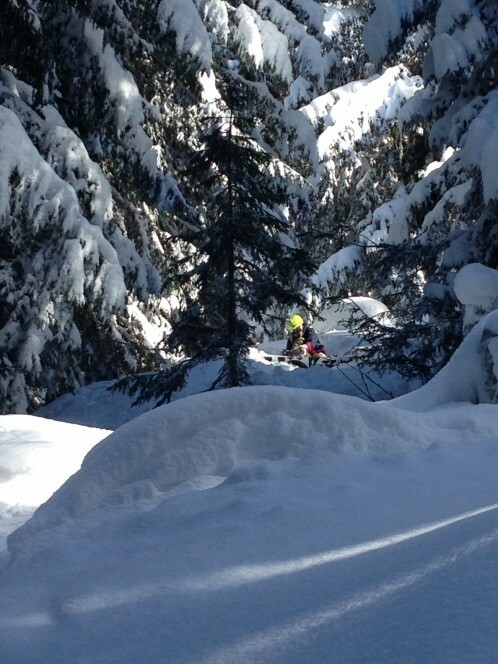 So yesterday a few of the girls and myself met at the top of the SuperMorzine lift and we spent a good 3 hours riding the same runs we have done many times before but always finding something new, a new route through the same trees or a new stretch of powder. There’s always a few spills and the odd one getting a bit lost, but the giggles and spontaneous chairlift singing more than makes up for it. Look at some other mountain activities Morzine and Mountain Mavericks chalets has to offer, this resort has everything! Previous: Recipe of The Week – Chocolate Fondant with Vanilla Cream!